This is sharp cheddar without the training wheels. Creamy white in color with an almost crumbly texture, it has a sophisticated citrusy tang. We like to say that it is an introduction to the "East Coast Cheddar Bite". A stellar snacking cheese paired with roasted nuts and ice-cold ale. Make no mistake, this cheddar is also excellent for cooking: A little goes a long "whey" when you melt it into cheese sauce. And a few slices of extra sharp will turn a simple burger into a work of art. Wil buy again and again! My entire family loves this cheese. We are so spoiled that we won't buy any other cheddar!!! I order it online because I can't find it near me. The best cheese in the world.. Taste, texture are the best. I love it with crackers, or on a sandwich. Sometimes just by itself. The quality can't be beat. 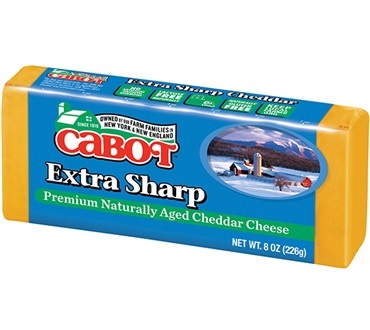 I buy mostly Cabot cheese but have to get it through the mail.